A large part of Never say never again was filmed in Villefranche-sur-mer on the French riviera. The first scene, filmed in the center of the village, shows Domino arriving at the old harbor with a speedboat from Largo's yacht that are anchored in the bay. When she gets ashore she is followed by Bond to "La centre de la santé". Bond following Domino and the view from the villa is covered in part 1. The old harbour where Domino gets ashore is located at 'Quai de L'Amiral Courbet' in the center of Villefranche-sur-mer. The same pier is used today by launches from the large cruise ships that anchor in the bay, bringing in passengers for a days stroll in the village. Along the quay and the 'Promenade des Marinières' you can find a lot of great restaurants and cafés and it is a good idea to have lunch or a few drinks here. The view over the marina and the Mediterranean is magnificent here in the heart of the French riviera. This location, namely the old harbor, has also featured in an episode of ''The Persuaders!'' among many other films. Sir Roger and Tony Curtis are having drinks by the quay in the episode "the gold Napoleon", ordering an americano and a lemonade respectively. On the other side of the village at Port de la Darse, or the new harbour, the final scene of the Fatima Blush car chase was filmed. Bond is chasing Blush on his Q-bike (most of the other scenes were filmed in Menton) and the chase ends when Fatima drives her Renault into an old warehouse in Port de la Darse. Bond is lured to follow her only to get caught by a closing gate inside the building. You can find the old warehouse on the street 'Chemin du Lazaret' that runs alongside the marina. Inside you can also find the metal gates that traps Bond so it is fair to assume that even the interior scenes, including the dialogue between Bond and Fatima were filmed on location. At least the ending with Leiter "coming to the rescue" was filmed inside this building. On the other side of the marina is the spot where Bond jumps his motorcycle over the water. Hard to say exactly where but the house with the yellow facade is recognizable from the film. Bond is probably coming from 'Promenade des Proffesseurs' and jumps over to 'Chemin du Lazaret' before he drives into the warehouse after Blush. Bond's villa can also be found in Villefranche-sur-mer, in the gated community just above the village. Unfortunately, I have not visited the villa yet so no close ups are avaliable. But the house is visible from the village. You recognize the red facade in the left picture. It is on the balcony of this villa that Bond observes Domino and Largo aboard the Flying Saucer in the Villefranche-sur-mer bay. Between the old harbor and Port de la Darse is the Citadel located, an old fort where the exterior shots of Largo's Palmyra (supposedly in north Africa) were filmed. The Citadel and Villa Ephrussi de Rothschild (the interior scene of Palmyra) will be covered later. In Her Majesty's secret service 1969, Bond is trying to track down Blofeld through The Heralds' College or 'The College of Arms' in London. Blofeld has contacted the College to get his title as 'Count de Bleauchamp' established and Bond is switching place with a representative from the Heraldry, Sir Hilary Bray Baronet who is the Sable basilisk of the College. The College of Arms is the official repository of the coats of arms and pedigrees of English, Welsh, Northen Irish and Commonwealth families and their descendants. The officers of the College are known as Heralds and they specialize in genealogical and heraldic work for their respective clients. "One physical note may be that the real Bleauchamps are without earlobes"
The building originates from the 1670's after the old Heralds' building had been destroyed in the Great Fire of London in 1666. The front gates were put up in 1956 and came from Goodrich Court, Herefordshire where they've had originally been erected in 1870. The College of Arms can be found on the same location it has been since the 16th century, Queen Victoria street directly south of the dome of St. Paul's Cathedral. Some parts of the College are open for the public on weekdays between 10 a.m and 4 p.m. The first view shows St. Paul's Cathedral over the rooftops before the camera pans down to the entrance. S:t Paul's can be found just north of the Heraldry. It also featured in a deleted scene with Lazenby filmed after his visit to Sir Hilary Bray. The scene featured a foot-chase were Bond hunts down one of Blofeld's men, spying on him at the Heraldry. The original footage is lost but a photo with Lazenby jumping off a roof in front of the cathedral can be found in the book 'James Bond - the Legacy'. The best thing about the British is that things rarely changes, so the College still looks the same as it did in 1969. This building, along with quite a few other Bond locations, also features in the Sherlock Holmes movie with Robert Downey Jr. In For your eyes only Bond is sent out to track down the Cuban hit man Hector Gonzales, who is hiding in a villa near Madrid. The first scene after Bond has been given the assignment by the Chief of Staff in London, finds Bond in his Lotus Esprit supposedly on a country road in Spain, driving through some olive groves. 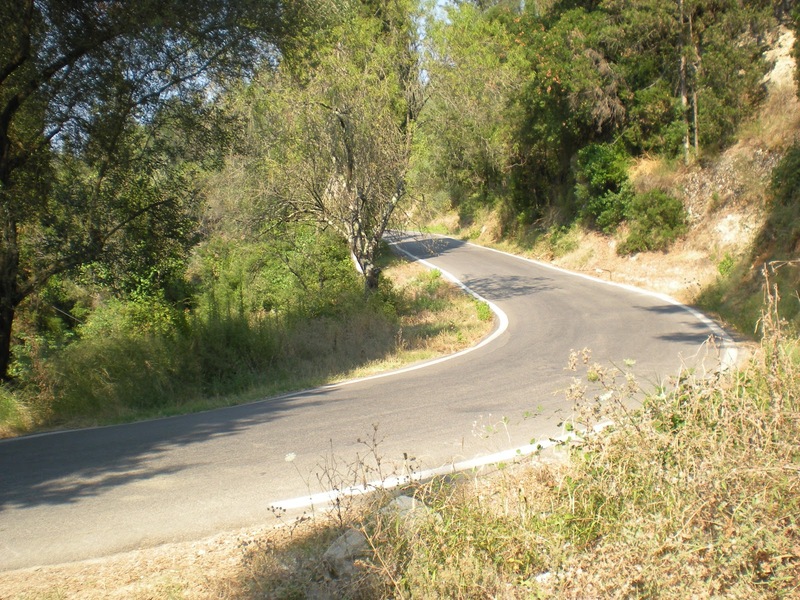 These scenes were shot, like all the scenes taking place in Spain, on location in Corfu, and the curve can be found just outside the little village of Pagi. On these roads the following Citroën car chase was filmed and even the curve was reused, filmed from the other side. It was in Pagi that Melina flipped the car over when trying to take "the low road". The Citroën CV2 chase and the village will be covered later. 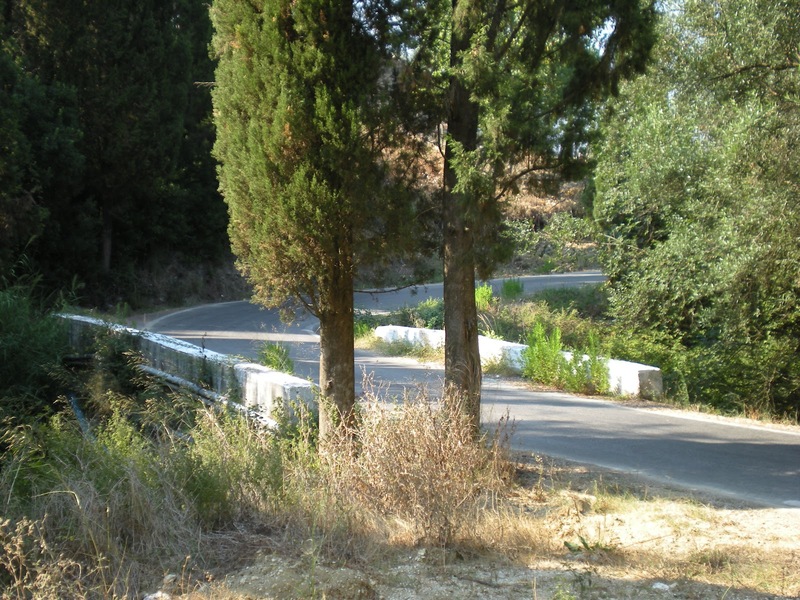 Surrounding the narrow roads are thousands of olive trees. The villagers are seen harvesting olives in the background, a scene that is very accurate considering the location. Corfu has approx. 2 million olive trees and especially in this northern part of the island. This explains the scenes with Bond and Melina driving through the olive grove during the chase and the harvesting villagers here in the opening. Whether you can find just as many olive trees in Spain (especially the Madrid area), I leave unsaid. After Mr White has escaped in Italy, Bond is back in London to pick up the leads. M is waiting for Bond in a rainy London and they meet in the apartment of M's bodyguard Mitchel, who had turned out to be a double agent. Mi6 have the perimeter sealed off and Bond is driven to the house in a Range Rover. The building, one out of three identical, can be found in central London on Edgware road. The buildings are located in a gated development with luxury apartments called The Water Gardens. The entrance where the Range Rover is stopping and Bond walks past the other agents from Mi6 can also be found on location. You have the best view over the entrance from Norfolk Crescent and from this side you can identify the balcony on which M is standing, namely the balcony on the 6th floor (out of 10). Notice the replaced white mosaic tiles to the left below M. If Mitchel could afford the apartment on a regular salary from Mi6 is unknown. 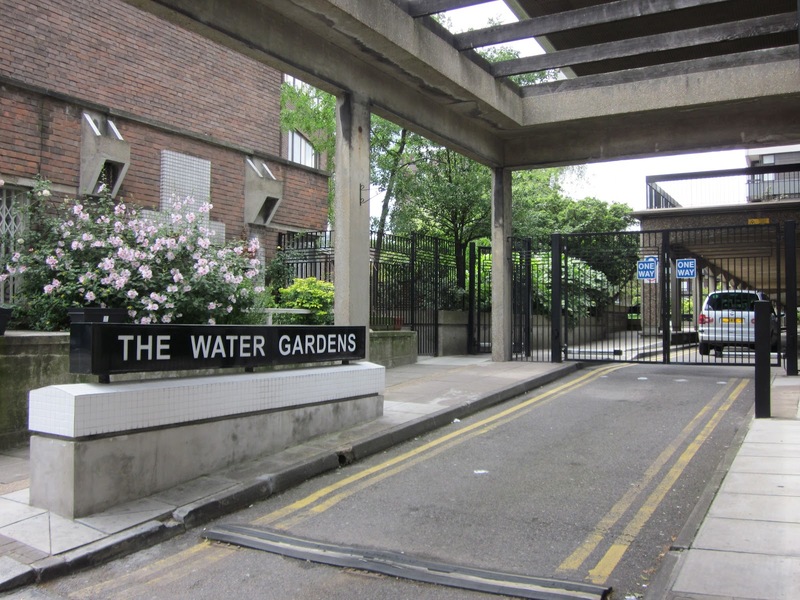 A two bedroom apartment in Water Gardens would probably cost somewhere between £ 800.000-1.200.000 so it is likely that some of the money comes from the Quantum organisation. Of course the interior scenes of the apartment were shot in the studios. From M's balcony you get a brief glimpse over the neighborhood. Here you see some typical English houses. These can be found on the adjacent street Sussex Gardens and many of the buildings are small hotels. Sussex Gardens intersects with Edgware road and Mitchel's building is the one closest to the intersection. 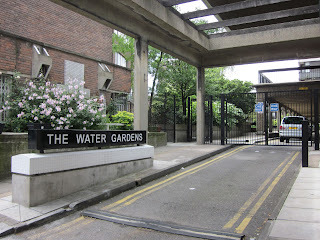 The Water Gardens can be found 159-169 Edgware Road. The easiest way to get there is to take the tube to Marble Arch and walk along Edgware Road. You will see the buildings emerge on the left hand side. Mitchel's apartment (or balcony) is located on the 6th floor in the building closest to Sussex Gardens.